I am increasingly concerned by the use of the word “customer” to describe people who use the NHS and social services. I hear it often in meetings and it is, in my opinion really dangerous. It is dangerous for 2 reasons: firstly, it assumes that people “buy” services, which they do not (because our services are not and must not become based upon ability to pay); and secondly it creates a very unhelpful understanding of how we expect people to behave in relation to their own health and the health service i.e. as consumers, rather than participants. I heard recently about a practice in Columbus, Ohio, in which before beginning an operation, each member of the team: the patient, the surgeon, the anaesthetist the nurse, the ODA and the recovery nurse all stand in a circle and agree who is responsible for which bits of the healing process. It takes into account the ‘checklist’ idea of Atul Gawande and expands it further. Each person, including the patient (except in emergency settings when they are unconscious) have some responsibility to take for the healing that is about to ensue. It is vital that the patient themself understands that they have a key role to play in their own recovery. If people think of themselves as the ‘customer’ or we think of them that way, we can all too easliy exclude them from taking an active part in their own health journey. The NHS is not a sweet shop or a passive experience in which you have things done to you – at least it shouldn’t be. Creating a ‘customer base’ is the antithesis of a social movement for health and wellbeing and we need to stop this really unhelpful language now! We are actively producing and encouraging a society of passivity and consumerism and we need a sizmic shift in our thinking to create a totally different approach to how we think about our health and wellbeing. 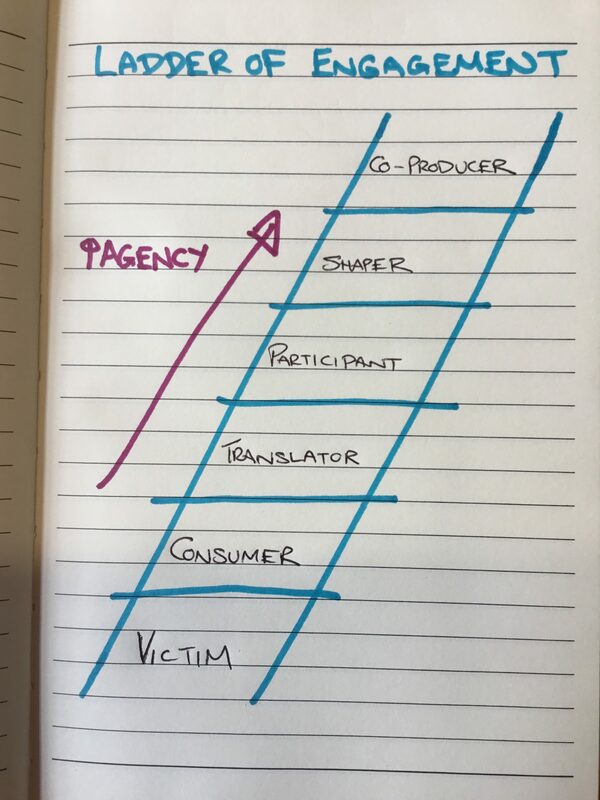 If we think of, or encourage people to think of themselves as customers of our health and social care services (and this applies across the public sector, so this could equally be written about education, the cleanliness of our streets etc) then we assign people to the bottom two rungs of the ladder as victims and consumers. It is no wonder that we are facing some of the issues we are. It has created an incredibly unhelpful and unhealthy power dynamic and has caused an enormous strain on our services. I’m not talking uncompassionately here. I know that many people have to live with long term conditions that can be utterly debilitating and difficult to cope with on a day to day basis. What I’m talking about here is how we respond to people who live with those complexities every day. We don’t have to treat them as victims, nor as consumers. Surely, we want people at least to be able to translate what their choices are – what’s possible for me or even what is in this for me? It would be one step better for people to be able to actively participate in their own care – this can be both active and reflective. But what about people being able to shape or co-produce the kind of care they would like to see and what might their role be in this? Co-production calls for a double accountability. What is the responsibility of the person who has a certain condition and what is the response ability of the service to work with that person or group of people around that condition/situation? It is not for us to be taking power away from people. We have to learn to work differently and to work with people. People using the NHS and Social Services are not customers and we must stop talking about them in this way. They are active participants in their own health and social needs, who should be able to shape and co-produce the kind of services we all need to improve our health and wellbeing. This kind of approach is vital if we want to see an end of the consumer mentality and an embracing of a greater sense of corporate responsibility. That is why I am so passionate that we take our financial difficulties and conundrums out to community conversation. It is not for those of us in positions of power to make decisions on behalf of our communities, (even though this is our statutory responsibility) because if we do, we will only deepen the victim/consumer mentality. No, we must be honest, change our language, share our problems and engage together to recognise that the future of the NHS and Social Care belongs to us all and is our shared responsibility.